That is the only way I can describe how I felt. Before me stood a huge, red twisted chunk of metal; three pieces squeezed and bent in agony, taller than my house. At the top of these joined, painful metal struts, the ends were bent outward over me like a shattered umbrella. The plaque told the simple story. These were the metal girders of the 93rd floor of the World Trade Center where Flight 11 impacted the North Tower on September 11, 2001. A massive square hole opens into the earth where each tower once stood. Into this abyss, water streams from the edge of the hole and flows into a black pit in the center of the fountain. Around the edge of each fountain, names are etched in somber dark brown illuminated from beneath. Each is the name of a victim of the terrible tragedy that took place on September 11, 2001. The memorial site is large and open with dead trees shaking their brown leaves into a brisk, cold November wind. Our friend, Denise takes us to one tree. It is not very tall but its leaves are still green in the midst of autumn as if the very life force lost in this plaza imbues it with hope. It is the Survivor Tree. Beneath these fountains, deep in the earth below where the water pours into that black box lies the museum and the memorial. We walked through this cavernous space surrounded by the roots of the metal trunks once holding the World Trade Center aloft for the world to see. Shorn off at ground level, these rusty brown squares mirrored the empty square above. There is a room breath taking, quiet, still and filled with a hushed kind of reverence. The four walls are covered with color photos of each person who died on that day. Some died in the airplane crashes. Some died in the rescue attempt. Some died in 1993 in the first attempt to bomb the World Trade Center, an event most of us have forgotten. But, the vast majority of the faces belong to the innocent people who came to work that day expecting a day like no other. I have stood in front of theVietnam War Memorial and wept. I have gazed upon the Korean War Memorial and felt moved. These memorials testified to the men and women who fought in wars against tyranny and evil. These men and women chose to fight for our freedom. But, the innocent faces looking down upon me in that room, most filled with laughter and hope never once planned on fighting an invisible enemy. When they came to work on September 11, 2001 it was not as a warrior in a battle against evil. It was to live and laugh and love and grow and hope and look forward to a rich and full future in America. I cannot breathe! As we move through the actual exhibit reliving those days, I am paralyzed with fear and paranoia. I am in New York City just a week after another horrific attack by terrorists in Paris. I never know when the next bomb will explode or if the person walking in front of me is bent on killing innocent people he or she assumes is a non commissioned warrior in the battle of ideals. I cannot breathe! My heart is pounding and in a panic, I try and find my way through the exhibit. Voices from that day echo around me. Images flash and move. The World Trade Center towers explode and bleed smoke and collapse over and over on an endless video loop. I must get out of here! I push my way through the story, through the rescuers who represented the best of God’s people, through the young men and women agape at such horror and never understanding it because they have not lived it, through the old men and women who remember the price of freedom and know the crush of tyranny and long for a world in which the face of evil was simpler and more easily recognizable. I rush through the exit door and hurry past the crushed fire truck and the remnants of the broadcast tower from the top of one of the towers and into the restroom. I wash my face and gaze at the reflection of this aging man in the mirror. Evil triumphed here for a season on that day. I remember the night before September 11. I had returned from a trip to Los Angeles where the narcissistic longings and attitudes of those around me led me to conclude in a conversation with my pastor, “God is going to allow something to happen to our country to get our attention.” I sat in the gate waiting to board our flight back to Louisiana and saw a couple with Middle Eastern “appearance” and for reasons I could not fathom, was convinced they were going to hijack our plane! An airplane had not been hijacked in years. And, the night before 9/11, in a sweaty, restless sleep I had dreamed I was standing on tall mountain on the east coast looking out upon our country. From the west, a shadow arose and assumed the shape of a huge, red serpent. In that dream this serpent devoured everything as it came toward me until all of my country was gone, eaten, digested by the face of the Enemy. The morning of 9/11, I awoke tired and discouraged. I told my wife, Sherry, about the dream and this is what I said to her. “Sherry, something terrible is going to happen to our country today. I don’t know what it is, but it will be devastating.” She was so disturbed, she later when to check on a friend of ours suffering from cancer. They were together when the towers fell. I went to work at my hospital near Barksdale Air Force base. I had not been working long when my friend, Gray Cooksey, now gone on to be with the Lord, beckoned me into the transciptionist’s office in radiology to see the television. My heart fell as I saw the first tower on fire, smoke billowing into the air. Around me, the Xray technologists and secretaries were talking about this “accident”. How could an airplane fly into the World Trade Center? “This is not an accident.” I said. “It is deliberate. We are under attack.” They scoffed at me until out of the edge of the image on the television, the second airplane struck the tower in a cloud of fire and smoke. Later in the morning, I walked outside to get some air. In the distance, I watched a white and blue airplane take off from Barksdale Air Force Base. It was Air Force One. President Bush had been taken to the base and it’s underground silo for protection. I went back inside to tell everyone and Dan Rather, on CBS news was pointing to a map of Louisiana telling the world where the president could be found. It was like putting a huge bullseye on our city! Shortly after that, Bush addressed the nation from Barksdale Air Force Base. Only, he was no longer there. He was long gone. We were now a potential target! That evening, I sat down with our children, Sean, age 17 and Casey, age 14 and told them the world had changed forever. Nothing would ever be the same. And, it wasn’t. For the next six weeks, the face of America changed, focused on finding some reason to hope; some enemy to destroy; a God to trust in. But, I knew it wouldn’t last. By Christmas, the humility and lessons learned were gone. America was itself again; narcissistic, self centered, godless. All of these remembrances flooded my mind as I stood in the stark restroom beneath the earth, beneath the site of terrible evil. What lesson was to learned here? What would people take away from this place? Hopelessness? Paranoia? Evil being a faceless force in our universe? What did you learn from that day? Often, I am asked how could God exist if such evil exists? Why would a loving, benevolent God allow such horrific acts to occur? Where was God on 9/11? The answers are not easy to come and even more difficult to understand. For I am convinced that evil originates not from a loving God but from us; rebellious, selfish humans who have the capacity to twist and deform any system, no matter how good, into an instrument of our own personal agenda. Throughout the story of how God has dealt with man in the Bible, we see a God who uses people many times to fulfill His purpose. Why would he use such flawed instruments? Because, like steel exposed to the fire of the blacksmith’s pit, the heat removes the impurities; burns away the nonessentials; leaves behind metal that is stronger for its ordeal. This was my hope on the days after 9/11. Would we grow stronger as a nation? Or, would we forget? The hope of the 9/11 Memorial lies in its unrelenting presence; its testimony to the truth that evil is among us and can prevail if good men and women do not rise up to resist it. The silence that reigns in those stone hallways screams to our consciousness the need for remembrance; the necessity of understanding if we do not learn from our past, then such disasters are truly a failure of humanity. Only when we remember and choose to not repeat the mistakes and evil deeds of the past can we triumph over pure evil. This is what I took away from my evening immersed in the aftermath of such tragedy. We cannot forget. We must remember. We are the instruments of God’s battle against evil. He chooses to work through us to make this world a better place. So, we must remember and learn from the past and kindle the flame of hope for the future. 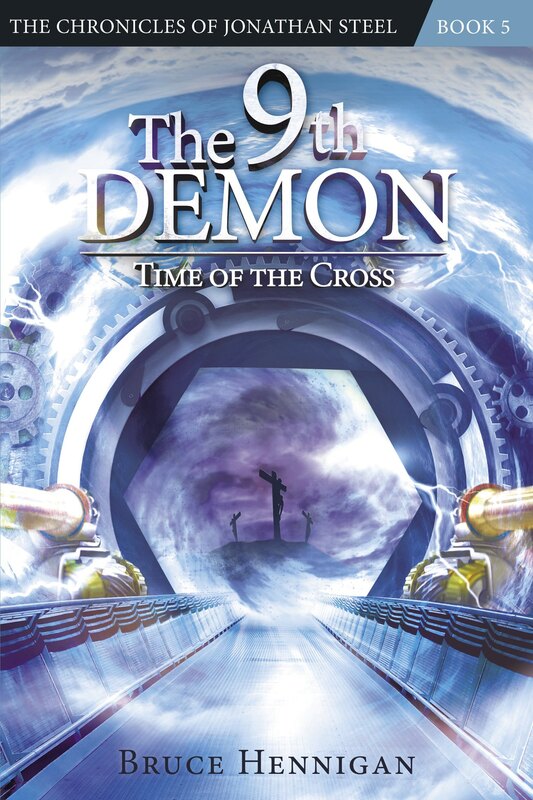 Order “The 10th Demon” NOW! eBook and print copies of the “The 10th Demon: Children of the Bloodstone” are now available. I will not have a book launch on Friday, November 13th because my printed book is not yet ready. BUT, you can order the ebook from Amazon, Nook, etc. First, my print books need some minor revisions and I will not be holding a book launch on November 13th. I’ll wait a couple of weeks. But, the ebook is available for pre-order now! Next Saturday, November 14th Mark Sutton and Dr. Bruce Hennigan will be conducting their Conquering Depression Seminar at Brookwood Baptist Church from 9 AM to Noon. If you attend the seminar, you will receive a copy of the book, “Hope Again: A 30 Day Plan for Conquering Depression”, a set of deluxe LifeFilters, and a workbook for the cost of $25. For more information, check out our website, conqueringdepression.com. Or, if you attend Brookwood this weekend, there are information brochures and cards at the welcome center. We hope to see you there as we head into one of the worst times of the year for depression. Find out how to avoid the holiday blues and how to find Hope Again as we teach you how to conquer depression.